CSAS in cooperation with the KAS held the above conference on July 15-16, 2014 in Kathmandu which was inaugurated by Foreign Minister of Nepal Mahendra Bahadur Pandey. SAARC SG Arjun Bahadur Thapa, former ASEAN SG Ambassador Ong Keng Yong, Maj. Gen. (retd.) Dipankar Banerjee and Dr. Wilhelm Hofmeister of the KAS spoke at the inaugural. 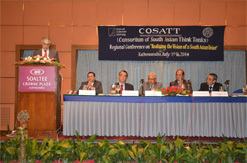 Heads of think-tanks of all SAARC countries participated in the event. Foreign Secretary Shankar Bairagi launched the CSAS-KAS book "Afghanistan in SAARC: Towards Deeper Engagement" on the occasion.